The GT Cars @ 2013 TIMETOATTACK Final Round + Results! | TIMETOATTACK! Home 2013 The GT Cars @ 2013 TIMETOATTACK Final Round + Results! Moving away from the ever-lustrous Supercars – we take a look at the rear-wheel drive GT cars that are packing more than just a punch, with the constant urge to let its back end out and give a massive grin to the driver’s face. 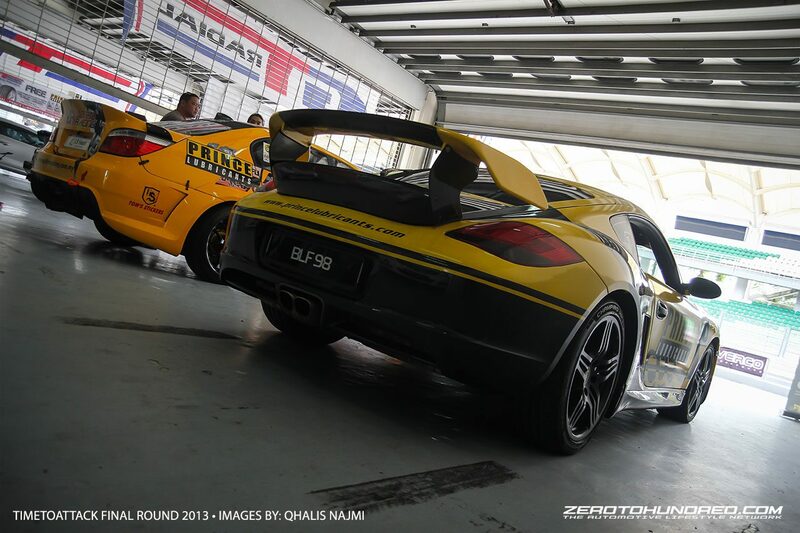 This round we are packed with a range of BMW M-cars and Porsche Caymans attacking the competition ground that is Sepang at TIMETOATTACK Final Round 2013. Attacking in this segment is a competitive battle between friends – as the ///M Owners Malaysia came in the bunch of trackies who were out to capture the best time. With a series of ///M cars like the E63 M6 and a very rare E46 M3 CSL making its way to the natural home ground of a track-ready road racer. 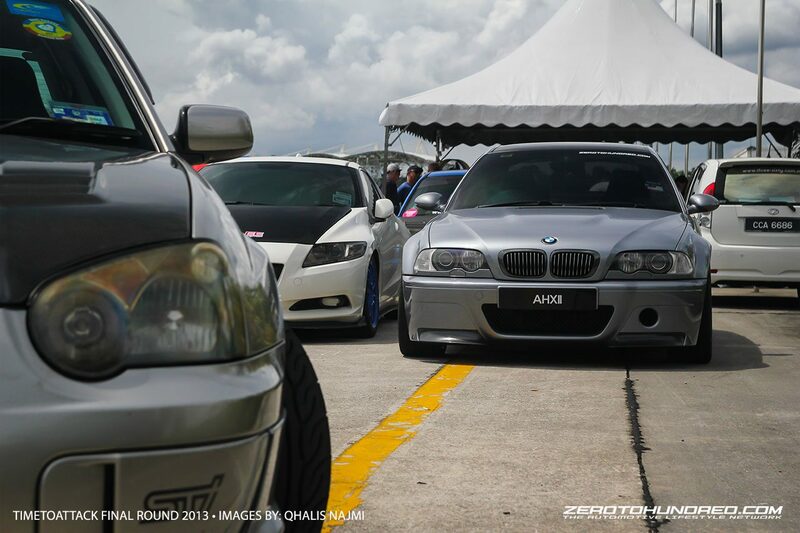 In the last round, the winning title fell to Tengku Djan with his modded up left-hand driven E36 M3. However in the final hours of TIMETOATTACK, he had to withdraw from TTA for S1K preparations..
Leaving the ///M boys to fight against the well-balanced Porsche Caymans. Mid-engined, rear wheel drive setup with a lightweight construction means the Caymans had the corners in its hand. Despite it being down on power compared to the Bavarian machines, the Caymans put a tough fight against the ‘Ultimate Driving Machine’ and gave a good show for the spectators alongside. But no doubt Heat 1 in the blistering rain meant slidey actions in the corners as the tyres fight for grip whilst powering through. The downpour did not make it easy for the attackers and many encountered problems in braking in the wet at points like Turn 1, Turn 4 and Turn 9 going into hard braking and heavy camber. 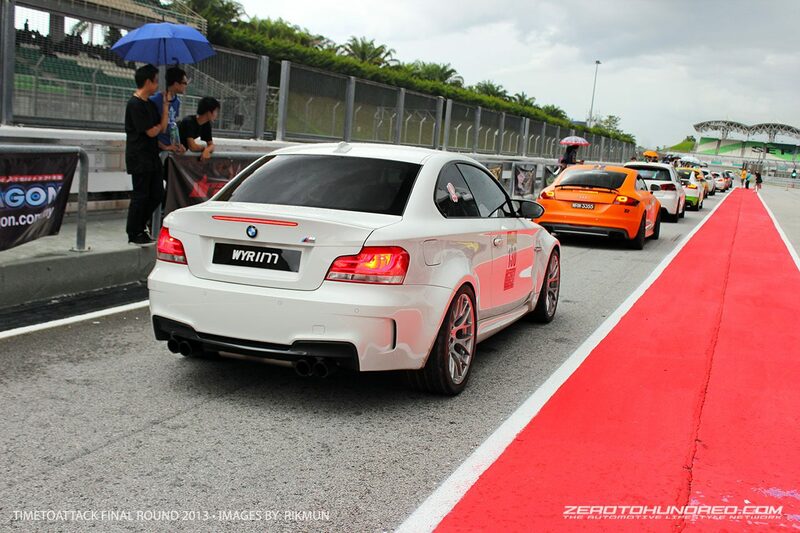 In 2nd place – Marcus Yong brought back the title in his boosted up BMW M3 E46 with a time of 2:34.775. With a gap of almost 10 seconds difference between Adrian in 3rd place, he ran the heat bravely against time. His E46 M3 has been tinkered and lightened for the purpose of speed and driving pleasure. Interior specs carbon fibre bucket seats to not only reduce weight, but hug the driver better under hard cornering. At the same time, fitted with Rays G25 forged wheels that only weighs a paper light 8.5kgs thus reducing unsprung weight, tagged with all-round Brembo sports brakes for better braking. We didn’t get to take a peek at whats under the hood, but we are expecting a lot! Little wonder why the gap between the winner was only a half a second difference! The winning title for the GT Cars class @ TIMETOATTACK Final Round 2013 fell to Nick Mah in his very serious track prepped Porsche Cayman S. Illustrated in a white and red accented livery in reminisce of the ultimate 911 GT3 RS 3.8 – it was no doubt from the track-side, we could see the attack was strong! Bringing home with a time of 2:34.009; the car was under full attack mode, packing a similar wing as seen on the GT3 RS and Hankook Z221 sticky semi-slick rubbers. We didn’t manage to take a peek at the car in person but the loud (probably straight-piped) exhausts hints a seriously modded-up package. 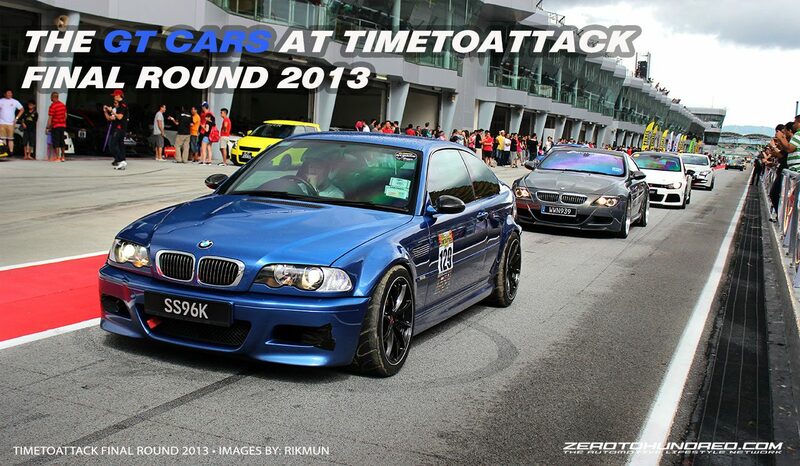 Congratulations to the winners and thank you to all the participants for attacking Sepang at TIMETOATTACK Final Round 2013. We look forward to see more competition in the GT Cars class next year and keep the challenge up! Previous articleThe Time Attack Machines and GT-Rs @ 2013 TIMETOATTACK Final Round + Results! Next articleThe high speed Supercars @ 2013 TIMETOATTACK Final Round + Results!